This is THE dress! I’m pretty proud I have to say. And here’s my DIY bridal bouquet – there will be another post about some of the wedding DIYs, as well. 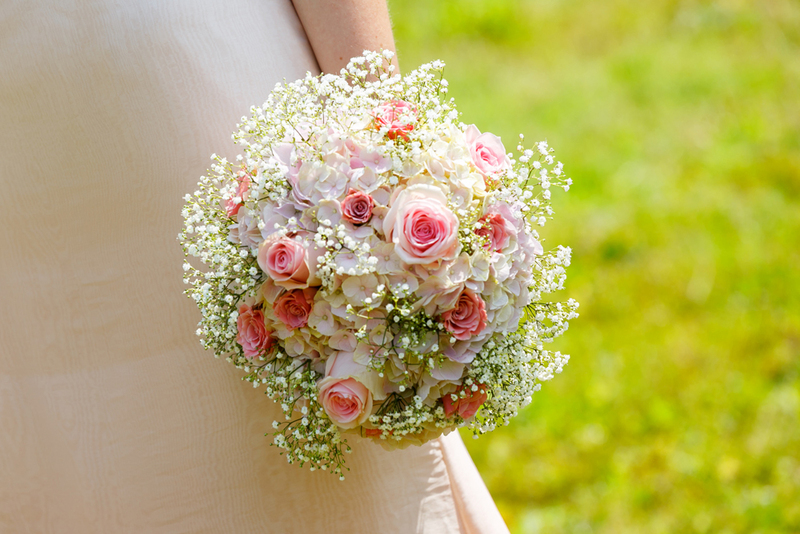 It’s hydrangea – my favourite flower of all time – , two kinds of roses and baby’s breath. Pretty simple recipe, but very effective. I absolutely loved it, and it turned out even better than my trial bouquet a couple of weeks before. I’m in love with the embroidery, I’d never thought it would turn out so well! As it was a super sunny day I also served as the disco ball at the party! I never wore the dress outside before, so the reflecting sequins were quite a happy surprise. First closing the waist-stay, so the dress would stay on and I had both hands free for the zip and button fastening. Putting on the lining top, then closing the zip. After that, putting on the delicate embroidered top and last but not least, closing the button fasting at the back. Me finding a loose thread just before the guests arrive. These pics show the layers of the dress nicely and my matching shoes! 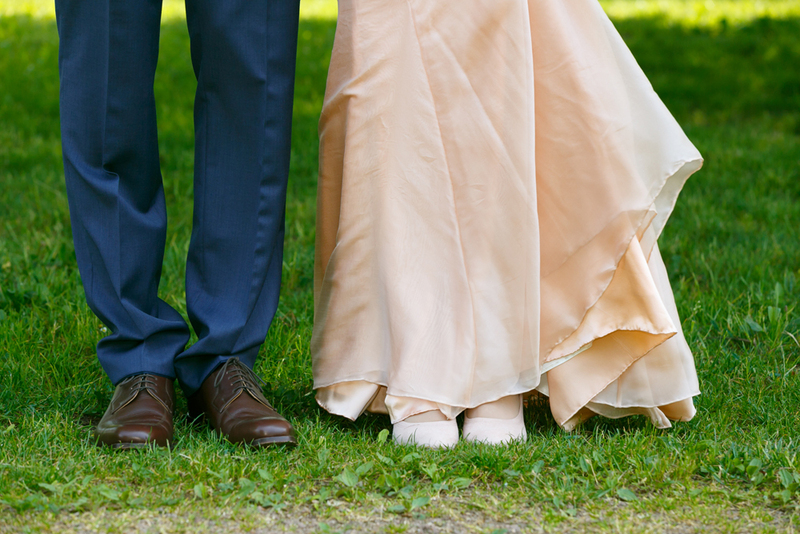 Shoes and bag and everything colour coordinated in blush pinks and champagne matching our pastel themed barn wedding. Trying to frantically apply nail polish before the first guests arrive, because yes, I forgot about that and was way too late for the party already. So I tried to squeeze that in between taking pic with out photographer and shaking hands with arriving guests. It was such a lovely, happy, wonderful day. 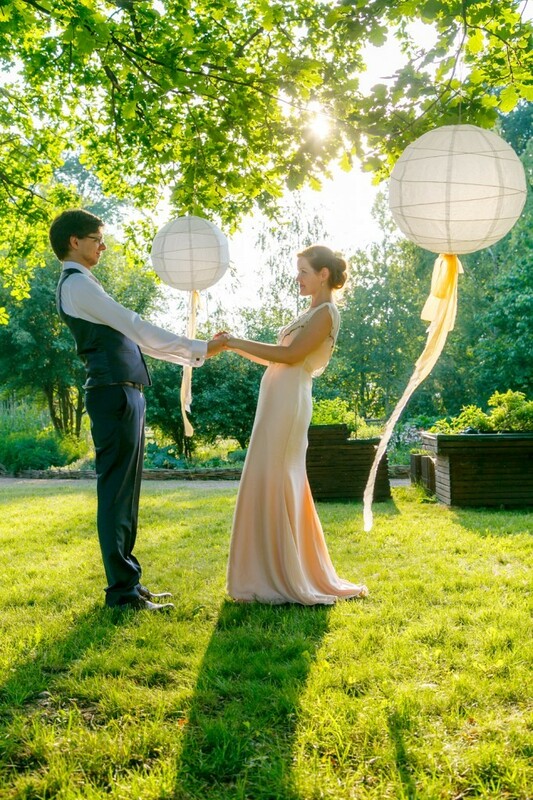 The complete wedding (reception, party, ceremony) all took place in a beautiful rustic barn in a tiny village in Germany. We got married by my wonderful grandfather, who was a pastor until he retired some years ago. It was unbelievably touching and romantic to be able to celebrate this way. After years living away from family in London, it was nice to see everyone again for this wonderful occasion. Most of the wedding was DIYed, not just including the decorations, but also my hair and makeup, some of my accessories, the bridal bouquet, our wedding cake and more. 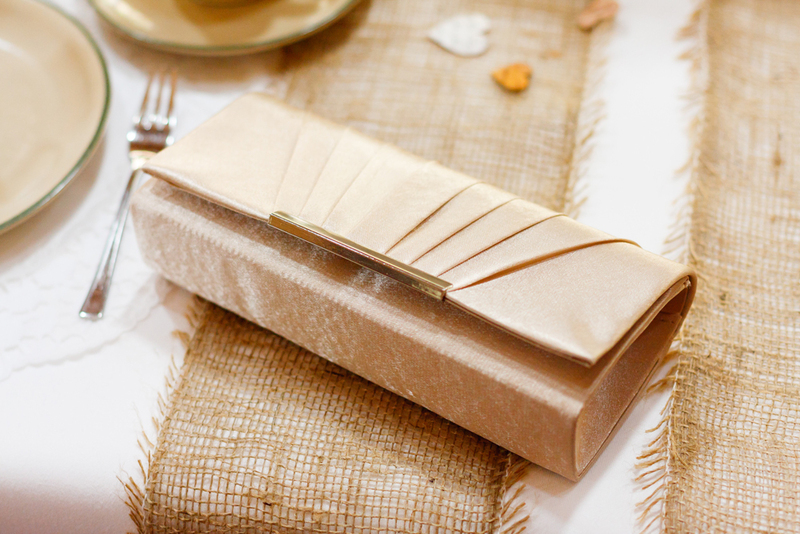 If you’re interested, I’ll share these on the blog, as well. If you have any questions regarding the dress or something else, just leave them in the comment section below. Here’s some more wedding pictures! Beware, there are quite a few – so grab a coffee or tea (or delicious, cold German beer) and enjoy! 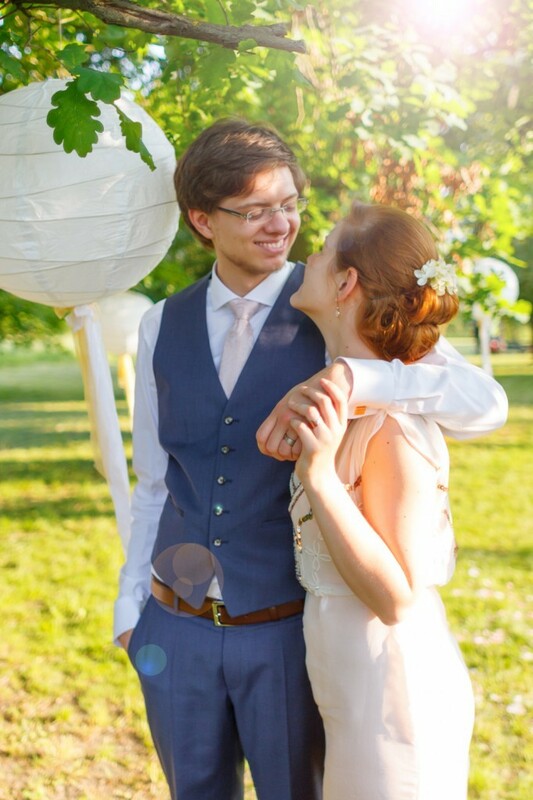 All the pictures were taken by our amazing wedding photographer who was with us the whole day, early morning until way past midnight, snapping our favourite moments and making all these wonderful memories last forever. 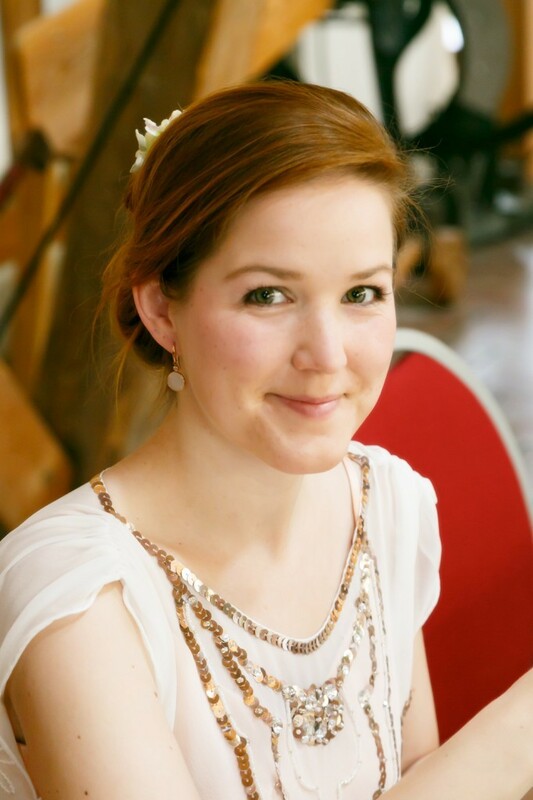 So if you’re getting married in Germany, check out his website! Let me know what you think. Have you made your wedding dress yourself? Or are you planning to? I’d love to know! If you missed out on any of the making of posts, just click on the wedding dress tag below or choose the DIY Wedding category on the right to find your way to the other posts in this series. WE ARE KNITTERS Giveaway Winner! 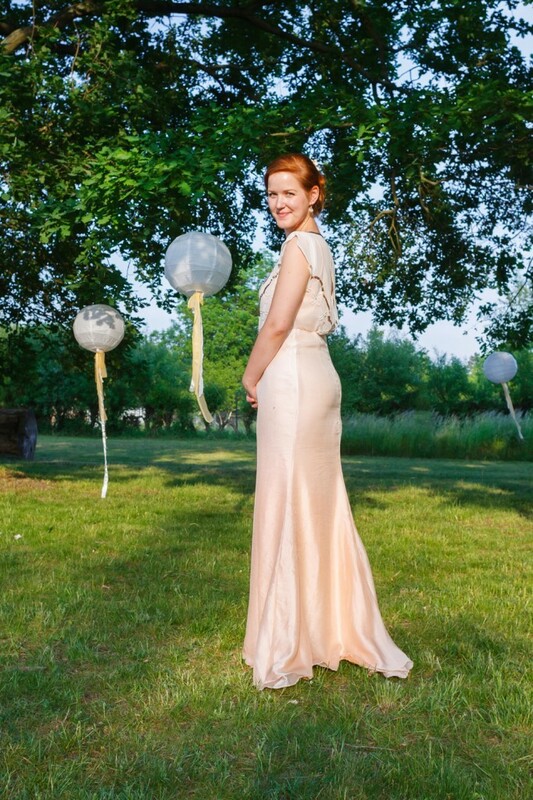 What a lovely dress and just right for your venue. My mother maid her wedding dress back in the late 50s and hated it by the time the wedding came round so I am pleased you loved yours. Oh wow! Did she end up buying a new one or did she go through with it and wore it anyway? My grandma had one made for her by a local seamstress, I think it’d be still gorgeous today. You did an amazing job! I’m getting married in October but I brought my dress! The bouquet invites, seating plan and favours are diy though! Absolutely lovely dress!! You must be very pleased! Thanks, Polly! I am! Although I had moments of doubt, it was the best decision ever to try and make my dress myself. Beautiful! Everything is just right. Congratulations! Oh Charlie, ihr seht beide fantastisch aus. 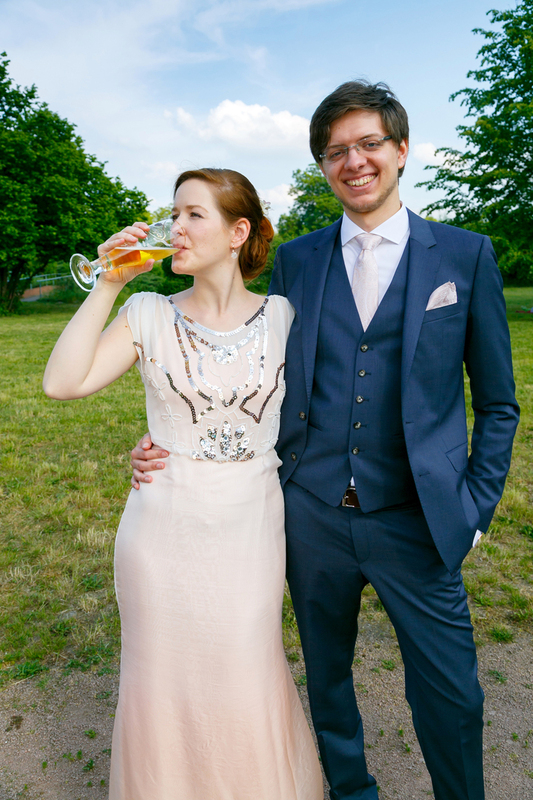 So ein tolles Kleid, es passt perfekt zu dir und auch zu eurer Hochzeitslocation. Tolle Bilder von euch, der Fotograf hat wirklich schöne Momente eingefangen. Das muss wirklich einer der schönsten Tage in deinem Leben gewesen sein. Wahnsinn, wie du das alles organisiert bekommen hast. Ich freue mich total für dich! absolutely stunning. how incredibly special to look back in years to come and say i made my dress. huge congratulations. Thanks, Sarah! I guess that was the thought that kept me going whenever it came to mind that this might be an incredibly dumb idea. Even with all the frustrating moments, I’m so happy I did it – all the time spend on it was absolutely worthwhile! You look gorgeous! 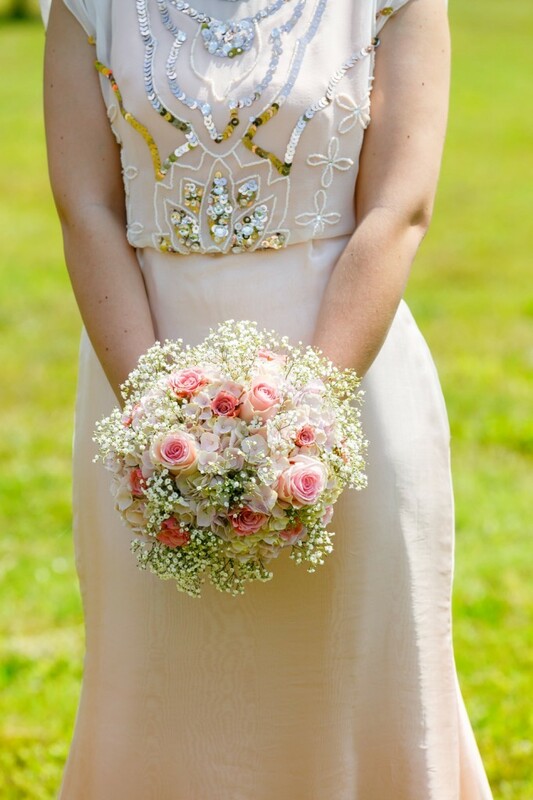 Your dress is absolutely beautiful – the embroidery really makes it stand out! 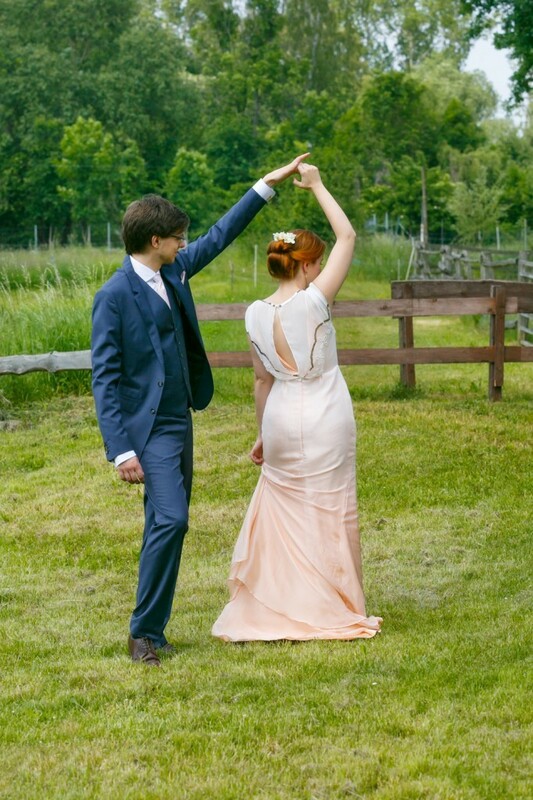 I made my wedding dress a few years ago, but we were eloping so it was a much simpler affair 😉 It was a silk Deer & Doe Belladone, but now that I have more sewing skills I’d be tempted to make a dress more like yours! That must have looked very pretty! While I was still working on the dress I regretted not having picked an easier design. Now that all the work is over, I’m glad I did it because there aren’t too many occasions to make such a special dress for! Congratulations! I really enjoyed all your posts about the steps behind this gorgeous dress. 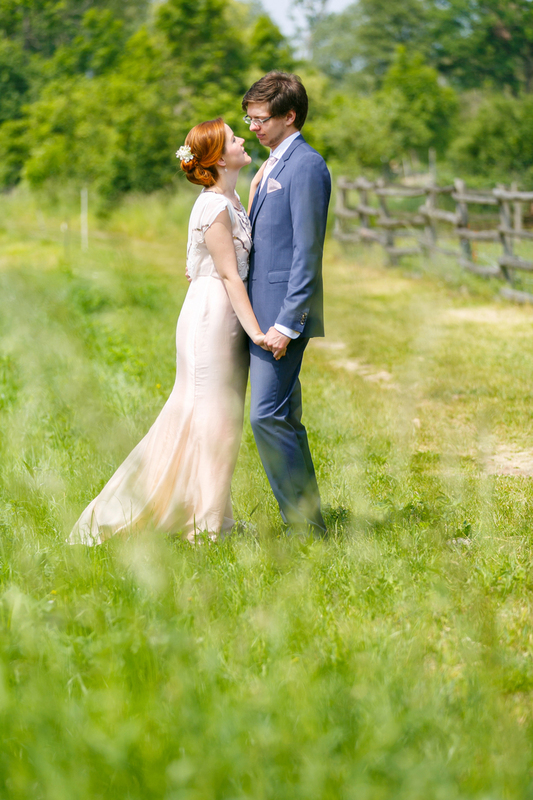 It’s so interesting to know what all went into the making, but what comes through in the pictures is just how perfectly well-suited the dress is to you and your wedding. You and the dress and the photos…everything…looks wonderful. You did an amazing job on the dress. This is STUNNING! 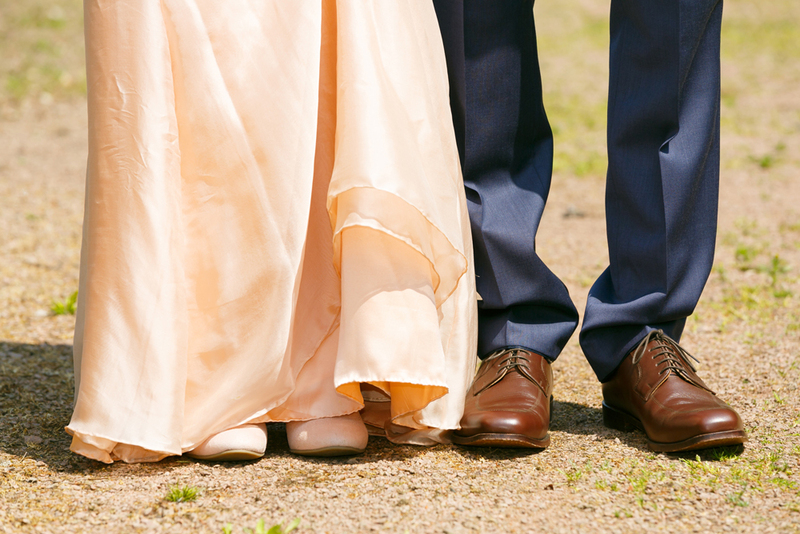 It’s the best when brides dare to do something out of the ordinary, this is so beautiful. Thank you, Nikki! I was worried about the ombre non-white dress and (at least in our area) unconventional minimalistic silhouette at times, but it all came together in the best possible way. Wow! Your dress is absolutely stunning. Your hard work paid off. 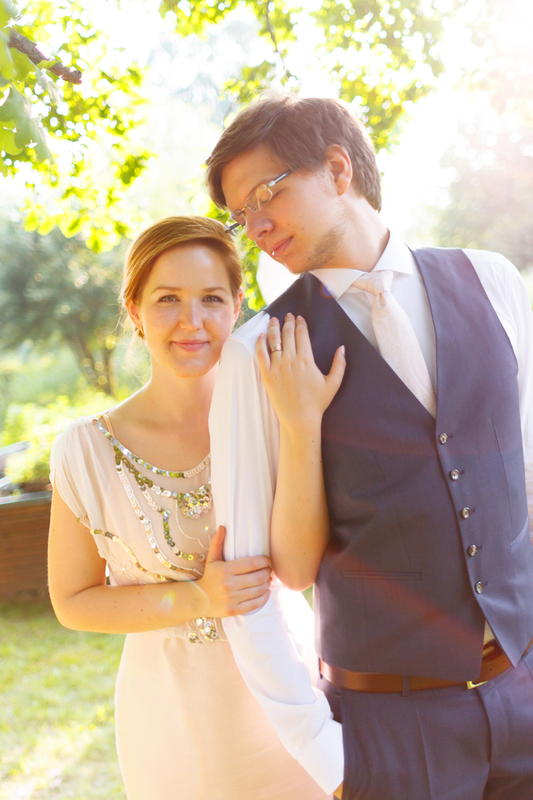 I made my own wedding dress 9 years ago, but it was not nearly as detailed since we were eloping. I wish you two all the best! Thanks, Sarah! Love to hear how many of you made their own dresses. This is fantastic! Hi Becca! Thanks for the lovely comment. I’m so glad I could inspire you to try embroidery yourself. I had no idea what I was doing, I just found a way that worked for me. Good luck with your wedding party dresses! 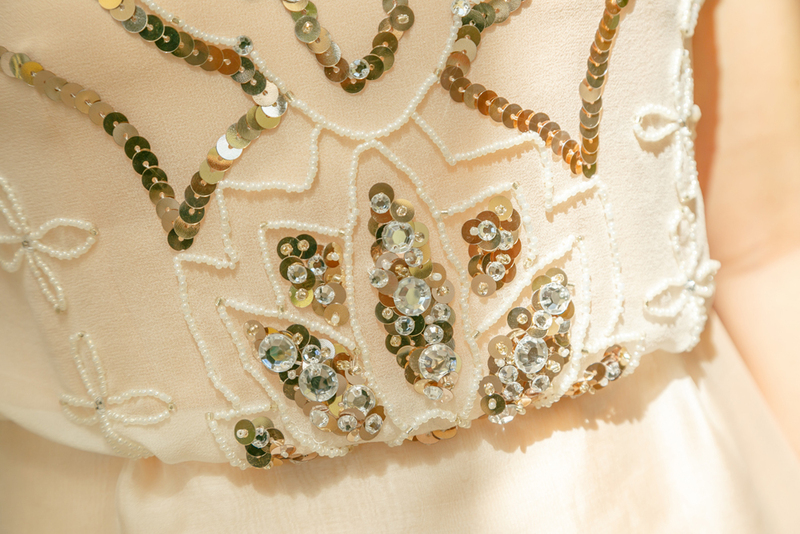 Your dress is absolutely stunning – that beading and sequining is amazing, and I love the top lining and overlay. Gorgeous job, great photos – and congratulations! Thanks! When I bought the fabrics I thought the blush pink lining would be too daring and now it’s one the features of this dress! 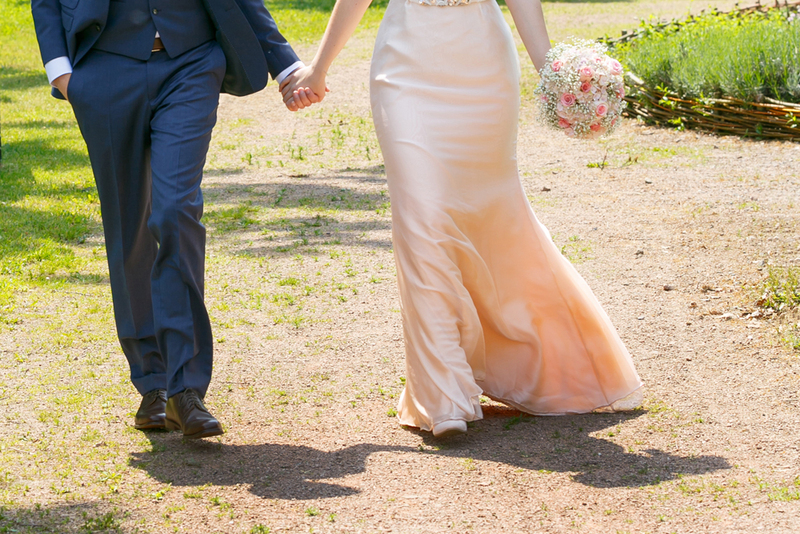 You look stunningly beautiful in your one of a kind gown made by a one of a kind you! 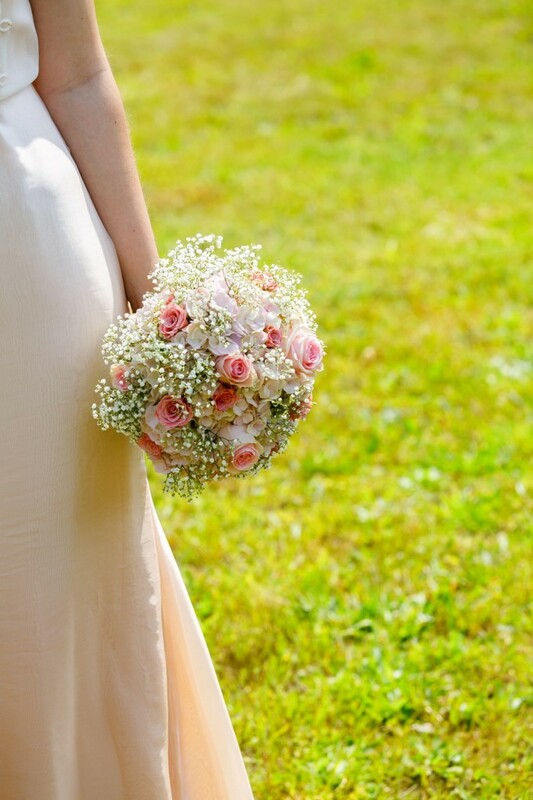 The dress looks so nice on you and I love the bouquet that you made also. Pictures are great. Germany is a beautiful country. I too like the picture of your husband kicking up his heels like a young colt. I have immensely enjoyed following the making of your dress. It shows how much work is truly put into the making of a dress, especially a wedding dress. Just everything is perfect! Absolutely stunning. You both look fabulous. I’m so glad it all worked out exactly as you’d hoped and thank you for sharing the process. 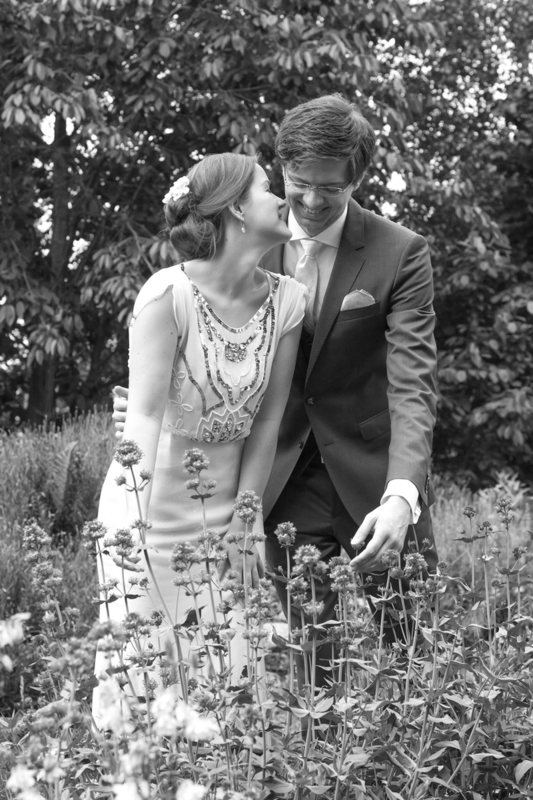 Thank you for sharing your wedding photos, the dress and you look amazing. 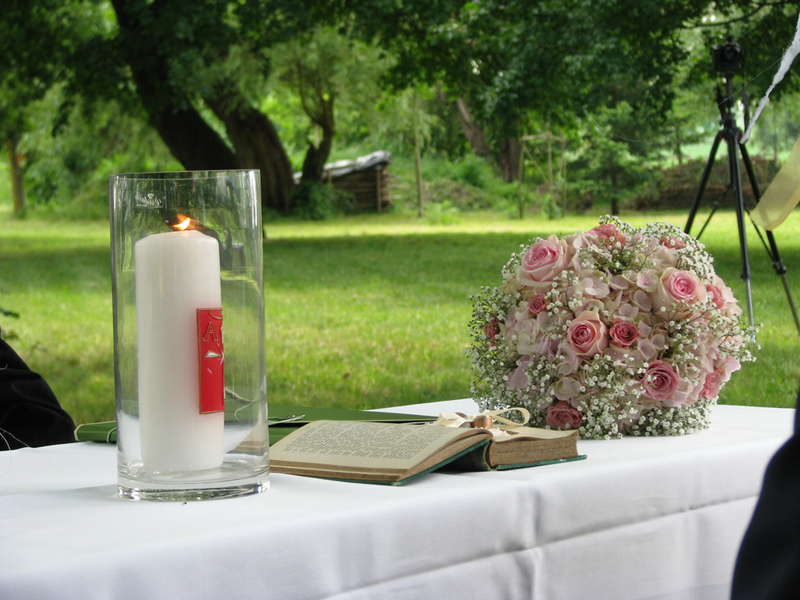 DIY weddings are the way to go, so relaxed and natural, perfect. Thank you so much, Susan! 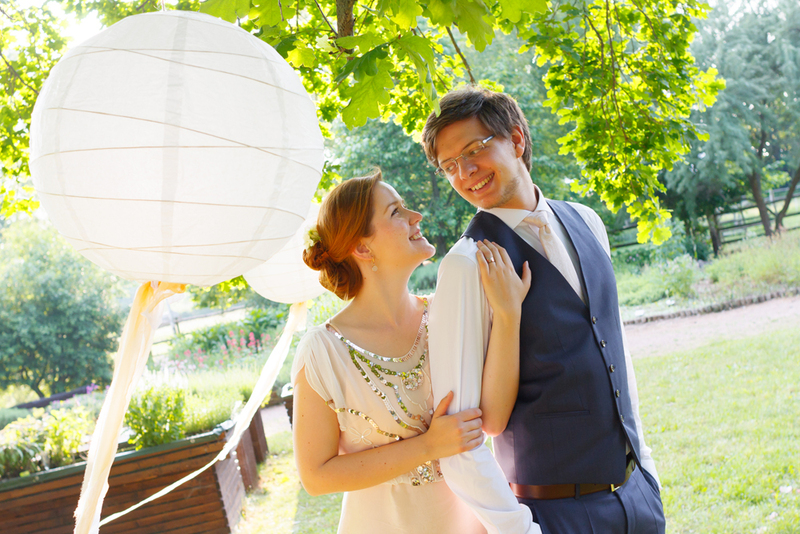 Yesss, DIY wedding are beautiful and I enjoyed every bit of it. But they are also very time-consuming and frustrating in preparation 😉 But it was worth it in the end. Your dress is so beautiful, the embroidery is exquisite. There are for too many wonderful photographs to pick a favourite and they bought a tear to my eye. BUT oh my goodness you nearly gave me heart failure seeing you put nail varnish on while in your dress, you must have nerves of steel! Aww, that’s so lovely Michelle, thank you! And yes, now that you mentioned it, it stresses me out thinking about it, but at the time I absolutely only cared about getting my nails done on time, hehe. Wow! I love all of it! The layers, the delicate colors, the subtle change in nuance from top to bottom, the embroidery (WOW! What a great job you did there! ), the overlay and blousing effect, the silhouette… I love this style of wedding dress, and I would definitely choose something very similar if I am so lucky to be married one day! Stunning job – you should be beyond proud of yourself. Oh, thanks Birgitte, that means a lot! I hope to see more dresses like this out there 😉 I’m not a very big fan of pouffy big dresses and simpler ones that don’t look boring are hard to find. Go, handmade! loved peeking in on your whole process, and WOW, the finished dress! STUNNING! i’m so glad you gave us a ton of pictures, i feel like we were guests at your beautiful day :). So pleased to see the finished dress at last. It is gorgeous and you had a lovely day by the look of it. My husband proposed to me in December 1969 and we married in February 1970. 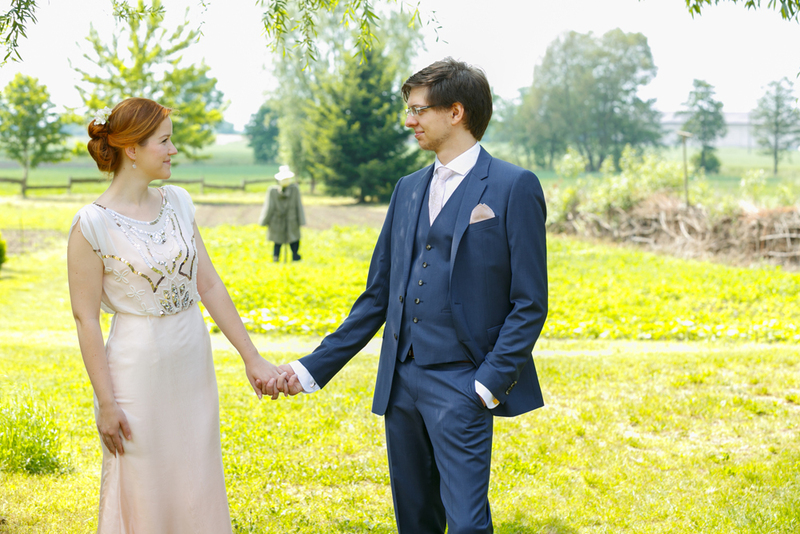 We weren’t very young so decided not to wait and weddings were not the bug events they are today. 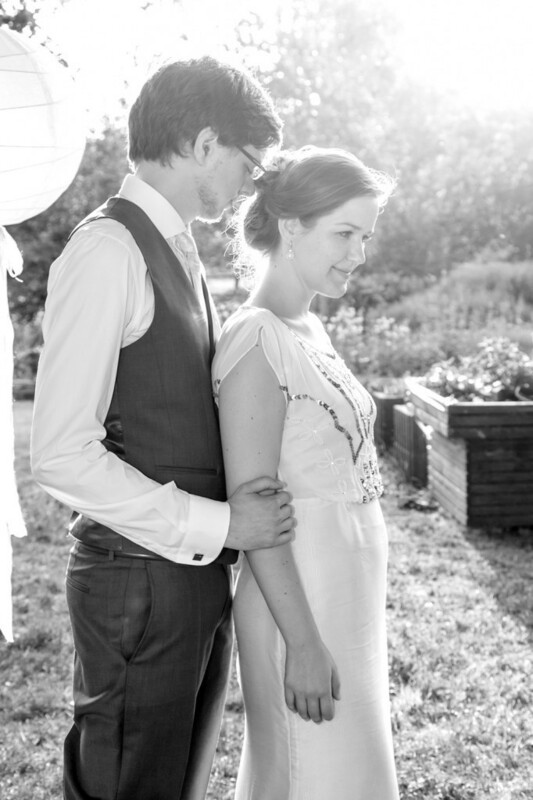 It was a simple wedding and I made my dress and enjoyed every moment. 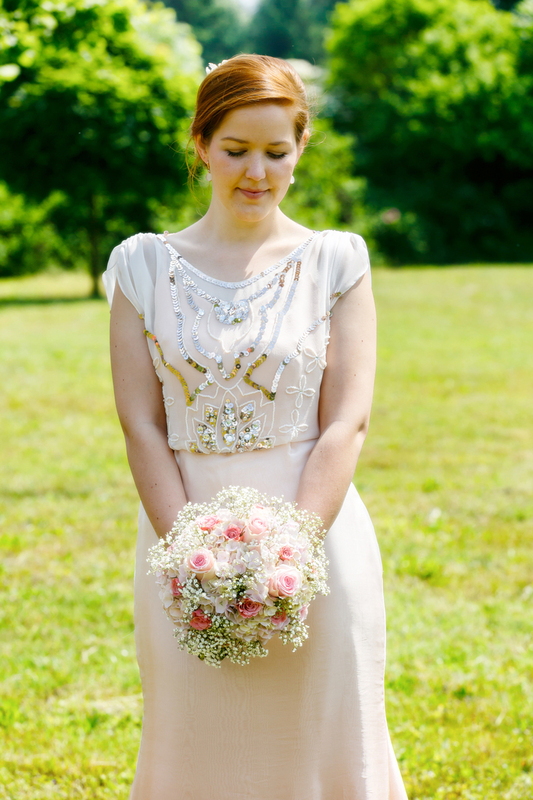 It had tiny pearl buttons down the front and a lace camisole over silk dupion. Sounds lovely! Did you keep the dress? Just perfect, fit, colour, style and the embroidery adds just the right finishing touch. I hope you and your husband have a very happy and healthy future. No words can describe how beautiful your dress is!! Wow!! So impressive! All of the hours and love you have dedicated to this dress is visible immediately! You seem to have had a lot of fun taking all the wedding pics! All the best for the future, happiness, health, success and endless love for each other. Your dress is stunning! In fact your whole wedding is stunning! Love the blush colour and loved seeing the making of the dress. I’m getting married next year and really want to make my dress but I’m not sure I have the skills. You are very inspiring though!! This is just so utterly beautiful. Modern and vintage at the same time. 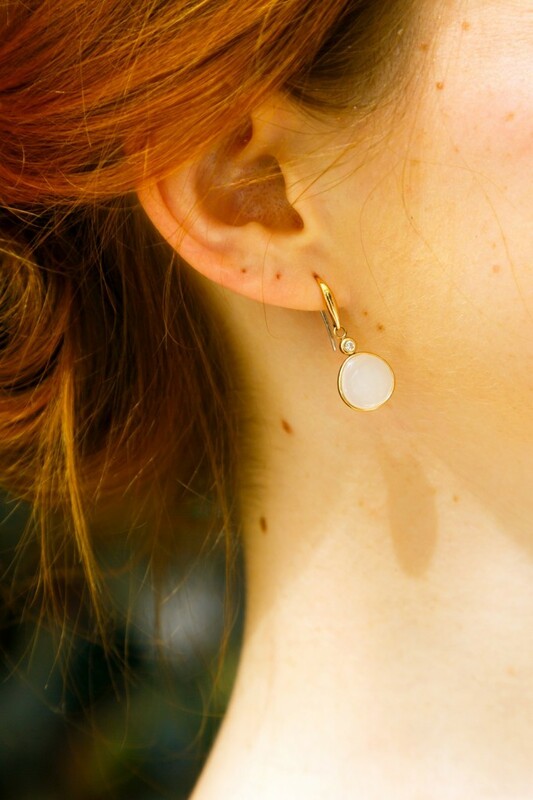 Your beading is stunning. Lovely work and you both look like you had a wondrous day, which in the end is what it’s all about. I just found your website through closetcasefiles and holy wow! 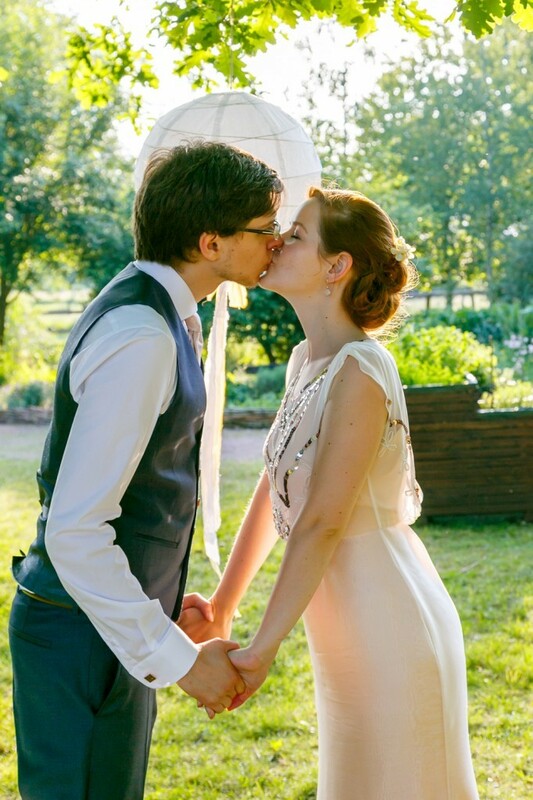 I am so impressed by your bravery and incredible skills to make such a gorgeous, perfect, well-fitted dress for your own wedding! Kudos! So inspiring! I just got married last October and was an emotional wreck through the last 6 months of planning so I can’t even imagine! Many blessings and wishes for your happiness! What a beautiful job you have done! The colour is stunning, so soft. I love the movement of the skirt and the overall silhouette. Congratulations! Absolutely beautiful. Well done! I’ve enjoyed reading the posts. 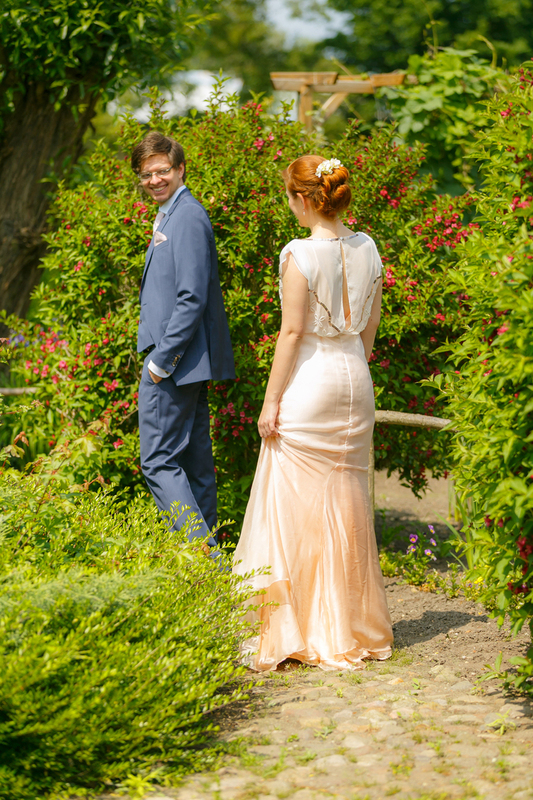 I designed and made my daughter’s wedding dress for her wedding last month. There are some details and photos on my blog though I don’t have access to all the photos that were taken as yet; I ended up deciding not to share all details as I was doing a college course at the same time and had to do a lot of writing for that. 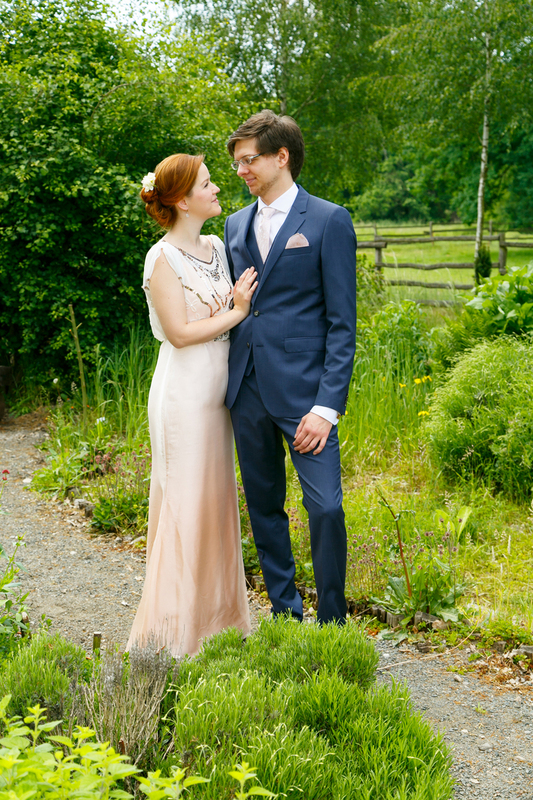 There are also some details about the bridesmaids dresses, which I designed, and the groom’s waistcoat which I made from a pattern, on my blog. This is absolutely beautiful! I am making my dress also, it just seems right! We are getting married at the court house in San Francisco, California, so I decided I want a cocktail length dress. Our wedding is in August so I will post about it after! 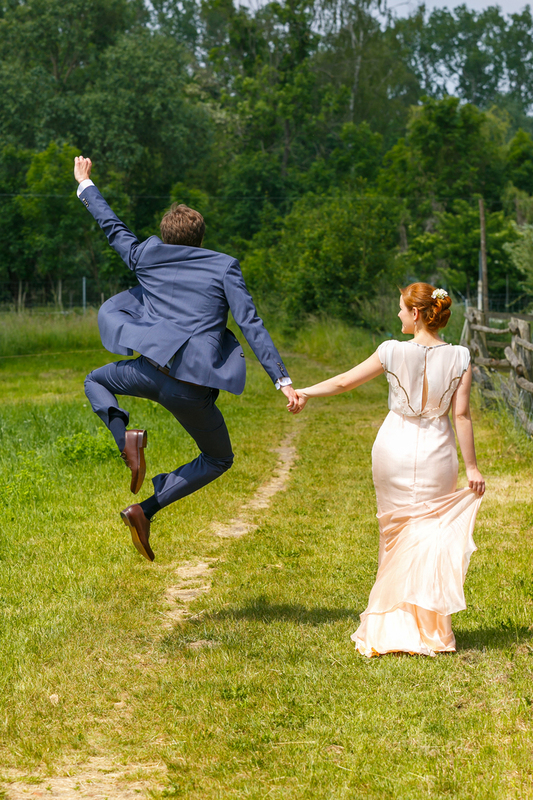 Your dress is stunning, and your wedding looks like it was so much fun and filled with love. Congrats! 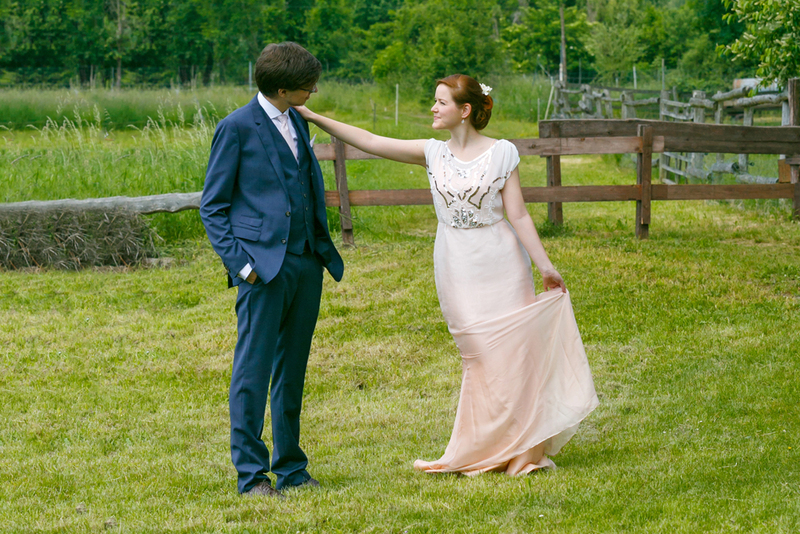 Wow – blown away by this dress – can’t believe you made it yourself, it’s absolutely gorgeous and you’ll be able to look back on your wedding knowing no-one else will have worn the same thing as you. So stylish and pretty. I’m getting married in a month and the best DIYing I can manage is putting some glitter on some jars! Congratulations! SO BEAUTIFUL!! You make a LOVELY COUPLE!! May you both “SEW MANY WONDERFUL STITCHES TOGETHER in the “QUILT OF LIFE TOGETHER” GOD BLESS YOU! I’m about to embark on my own wedding gown. I want a medium weight poly satin bias cut, blouson style. I bought very cheap motive style lace which is probably not able to be cut on the bias. I’m at a loss how to use the lace I bought. I’d post pics but new to blogs/commenting. You are an amazing seamstress. 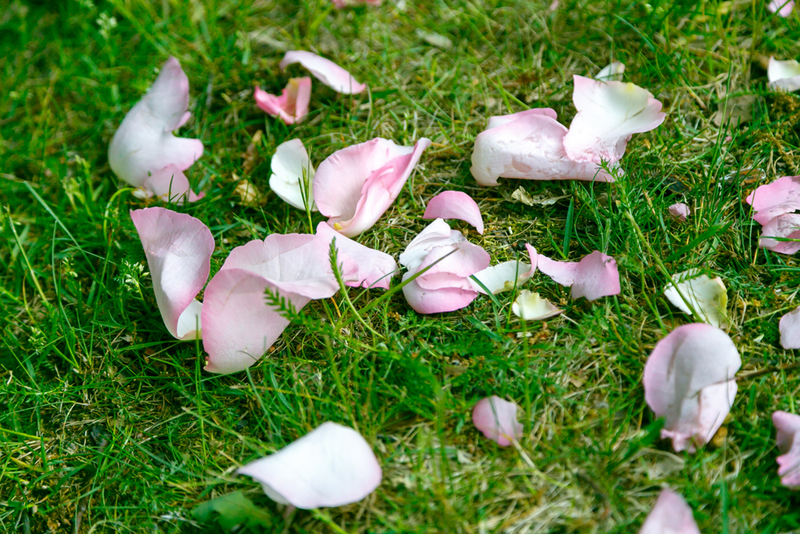 Your wedding dress is beautiful and you looked stunning on your wedding day. Thanks for sharing the inspiration!